The guys over at DonkDown are known for their pursuit in getting to the bottom of things in the UB Poker scandal. This weeks show gets off to an unexpected start when Travis Makar calls into the show. For those not familiar with Travis he was linked to the scandal in the report put together by our friends over at Wicked Chops. Travis makes mention of the missing hand histories and recordings that are being used in a federal case. For those that are interested in just the UB part of the show should skip ahead to the 30:30 mark and enjoy the ride for around the next hour. You can listen to the show at the DonkDown site or subscribe and download it via iTunes. This week the guys have one of the new team PokerStars members, Andrew Brokos, on the show but the main feature of the show is Eugene Katchalov. Eugene comes on and discusses his move to the US and some day trading before getting into the SuperStar Showdown that did not got his way. Eugene talks about how he prepared for the match by playing against Daniel Negreanu and then how the match actually went. Finally he discusses his Super High Roller win from the PCA. Listen to the show at the Two Plus Two Pokercast site or download it on iTunes. After giving you guys two podcast that have run times of over two hour each here is one that just eclipses the thirty minute mark. The guys over at PocketFives are joined by Lauren Kling this week to discuss her recent success, along with how she got started playing poker. Lauren also discusses how trying to make it in the poker world as a female can be difficult due to guys not wanting to give her the credit. Overall it is a good and short interview full of information from Lauren, check out the PocketFives Podcast on their site or via iTunes. Richard “Chufty” Ashby wins the third WSOP bracelet for the UK this year, taking down the $1,500 Seven Card title, denying Christine Pietsch in heads-up play. Ashby earns $140,467 for the win, with Pietsch pocketing $86,756. Full results and the Nolan Dalla tournament report are online at wsop.com. John “Tex” Barch makes his third final table the charm, winning his first WSOP bracelet in the $1,500 Pot-Limit Omaha event, defeating Klinghammer Thibaut heads-up. Barch adds $256,919 to his tournament winnings, with Thibault earning $158,698. Results and Dalla’s tournament report is online over at wsop.com. The third $1,000 No-Limit Holdem event concluded about halfway through level 9 with 290 players remaining who return Monday afternoon. John Tolbert leads the day 1a field with 73,900 in chips. The full list of chip counts is now available over at PokerNews. Day 2 of the $10,000 Omaha Hi/Lo 8 or Better World Championship gets underway at 3pm with Eugene Katchalov leading the remaining 144 players with 123,200 in chips. Other notables also coming back this afternoon: David Benyamine (102,500), Sammy Farha (98,500), Vladimir Shchemelev (88,300), Phil Hellmuth (84,300), Barry Shulman (76,200), Barry Greenstein (49,800), and Team Pokerati’s Tom Schneider (11,700). Only one tournament this afternoon, day 1b of the $1,000 No-Limit Holdem starting at 12pm. Don’t be surprised of today’s field is a great deal smaller than Saturday’s, as it has been in the first two $1,000 events. Follow all the action over at PokerNews and www.wsop.com. 101 players remain as the players return from their dinner break shortly. The current chip leader is Darvin Moon of Oakland, Maryland with 5,700,000 in chips. Some notables returning with chips: Eugene Katchalov (3,600,000), Fabrice Soulier (3,550,000), Jeff Shulman (3,200,000), Phil Ivey (2,680,000), James Akenhead (2,500,000), Antonio Esfandiari (2,300,000), Dennis Phillips (2,200,000), Tom Schneider (1,571,000), Prahlad Friedman (1,280,000), Peter Eastgate (940,000), Noah Boeken (481,000), Joe Sebok (300,000) and Kenny Tran (262,000). There are still two women left as well: Nichoel Peppe (1,300,000) and Leo Margets (1,195,000). Notable eliminations: Joe Hachem, David Benyamine, J.C. Tran, Theo Tran, Bertrand Grospellier, Blair Hinkle and Joe Serock. The Dream Team Poker event is down to Kenna James versus Judy Tejwani for the individual title. Congrats again goes to the Tao of Pokerati team for clinching the team title a few hours ago. Live updates now available for the Main Event at www.wsop.com and more stuff from the rest of the writing team during the evening. Sunday brought another three-level day to the WSOP, with just 185 players remaining when play resumes Monday afternoon at 12pm. The current unofficial leader is Warren Zackey, who’s listed from Honeydew, South Africa with 4,977,000 in chips. The most notable name at the top of the leaderboard is 2007 WSOP POY and member of Team Pokerati Tom Schneider at 3,168,000, good for 4th place. More notables, with their unofficial chip counts: Noah Boeken (2,4000,000), Eugene Katchalov (2,1000,000), Ludovic Lacay (1,685,000), Fabrice Soulier (1,450,000), Bertrand Grospellier (1,400,000), Blair Hinkle (1,100,000), Joe Sebok (1,100,000), Joe Hachem (1,000,000), Peter Eastgate (927,000), Blair Rodman (890,000), Joe Serock and Prahlad Friedman (760,000) and Kenny Tran (700,000). Notable eliminations: Kevin O’Donnell, Mickey Mills, Cornel Cimpan, Kara Scott, Dan Shak, Nick Binger, Bobby Baldwin, Kevin Saul, William Robertie and Can Kim Hua. Hopefully the official chip counts will be coming shortly, and Pokerati will be the 5th place to find them. Follow Pokerati also for Dream Team Poker updates, when they return from dinner break. Zac Fellows took down the $3,000 HORSE event in a marathon final table just a couple hours ago, outlasting James Van Alstyne to take a bracelet home to Canada along with $311,899. With five players left, Van Alstyne had over half the chips in play, while Fellows was extremely short stacked. Eventually he worked his way to heads-up with Van Alstyne, the stacks nearly even. After nearly two hours of heads-up action, Fellows would finally finish off Van Alstyne, leaving him drawing dead in the holdem round to finish 2nd, good for nearly $200,000 and take him over the $3m mark in career tournament earnings. Ville Wahlbeck continues his impressive run in World Championship events this WSOP, cashing in his fourth $10k buyin event. Steve Sung started play on Thursday 57th out of 57 players with just 6,100 in chips. The $1,500 NL Holdemevent finished exactly on the money as 270 players remain when play resumes at 2pm this afternoon. Glenn McCaffreywill start the day as chip leader at 187,800. Some of the notables who will also return on Friday: Dean Hamrick (134,700), Anthony Yeh (111,400), Kara Scott (81,700), Nam Le (57,000), and Thayer Rasmussen (50,200). Day 2 of the $2,500 Omaha 8/Stud 8 resumes at 2pm with 153 players returning, 40 of which make the money. Veteran pro Can Kim Hua starts the day chip leader at 51,800. Notables trying to surpass him include: Jon Turner (43,300), Shirley Rosario (36,200), Phil Ivey (33,600), Chad Brown (31,200), and Shawn Sheikhan (29,500). The 12pm tournament will be the $1,500 Limit Holdem event, which was won last year by Jimmy Schultz for over $250,000 in a field of 883. The 5pm event makes its debut, $5,000 Pot-Limit Omaha 8 or Better. The WSOP Staff Guide projects the $1,500 Limit Holdem event field as 880 (taking the under, 804 is my guess), while the $5,000 PLO 8 event has a projected field of 150 (take the over, 168 being my estimate). More news during the day here at Pokerati, so come back several times during the day. Compared to some of the marathon WPT final tables, it probably seemed like it took only ten minutes to complete the final table of the WPT Borgata Poker Open. 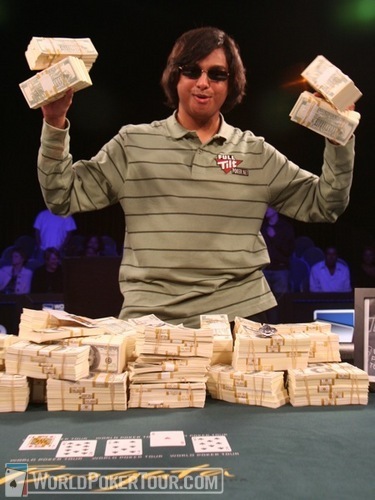 Vivek Rajkumar did, however, win the title in only 48 hands, beating the previous record of 53 hands set by Eugene Katchalov at the December 2007 Bellagio Five Diamond. Vivek was surrounded by his group of internet young-gunnish friends like Gobboboy and Devo, and the support probably didn’t hurt as he came to the table as the chip leader and went into heads-up play with a massive 16.8 million to 3.9 million lead over Sang Kim. That HU part of the event took only one hand, and Vivek was the latest to win a WPT title. Oh, and he won $1,424,500 to get a good haircut go along with the bracelet and the victory. Photo courtesy of World Poker Tour, where WPT Live Updates detailed all of the final table action. In the $1,500 NL holdem event, Jesper Hougaard returned from the dinner break seemingly in better spirits, as he was able to recover from giving up a 6.5-1 chip lead to Cody Slaubaugh to get back to having a very slight chip lead. A single $25,000 chip separated the two when the final hand was played out as Jesper’s QQ (with a 3rd Q on the flop) crushed Cody’s A-10. Hougaard takes home the bracelet and $610,000, while Cody has the consolation of winning $389,128 for finishing 2nd. The $10,000 Omaha 8 or Better World Championship led to another name being removed from the list of best players to never win a bracelet as David Benyamine won $535,687 and the coveted WSOP bracelet. Greg Jamison finished in 2nd, Mike Matusow finished in 5th, Eugene Katchalov was 6th, while David Chiu ended up in 8th. Benyamine’s win places him only 2 points behind Jacobo Hernandez in the ESPN WSOP Player of the Year race. The announcement that the $50,000 HORSE event later this week will count towards the standings means that plenty of big names are still in the hunt to take down that title. Happenings tonight at the WSOP. The $1,500 NL Holdem final table is now heads-up between Jesper Hougaard and Cody Slaubaugh. Jesper had been dominating the final table and started heads-up with $6,500,000 in chips to about 800,000 for Slaubaugh. Just 6 hands later, Slaubaugh had a nearly 2-1 chip lead as Hougaard decided it was now an opportune time to take the dinner break. They’ll return at about 9:30 PT to finish, the way it’s going it won’t take long either way. Follow along on the World Series of Poker’s update site here. The other final table on Page 2. The $1,500 7 Card Stud winner turned out to be Mike Rocco, who endured the barbs of Al Barbieri to take down his first bracelet and about $135,000.